NCT Granite is a slab serif typeface created by Nathan Zimet and published by NCT which is available in 9 weights (from Thin to XBold) and their italics, over 1200 glyphs per font and a wide range of OpenType features. Corners in curves suggest shapes achieved with a calligraphic tool. Narrow serifs at tops of strokes give the letters a Renaissance feel, Subtle curves and angles in the serifs give them more strength and motion etc. This robust and functional font it merge well on both screen and print. Also it has multilingual support. Have fun! Price: starting from $20,00 for one font to $150 for all 18 fonts. 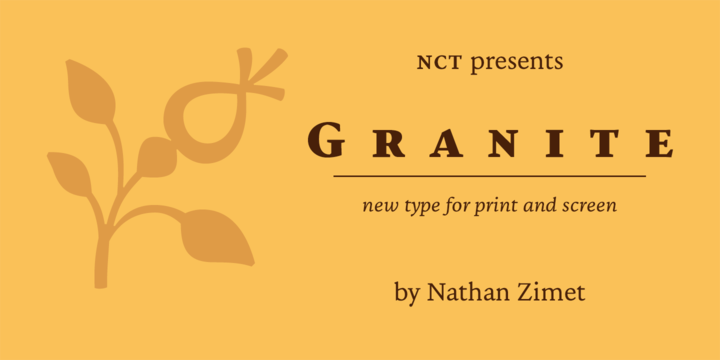 A font description published on Monday, July 31st, 2017 in Fonts, Nathan Zimet, NCT by Alexandra that has 2,403 views.